Frosty Windows Scarf is an original PlanetJune Accessories crochet pattern by June Gilbank. 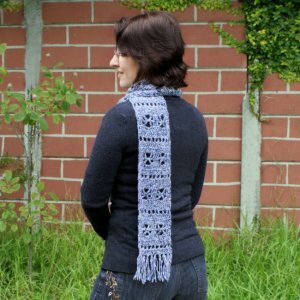 With a pretty but easy-to-memorise stitch pattern, you can work up this scarf in almost any yarn. Once you've crocheted a couple of repeats, you'll fly through it - it's a perfect pattern for handmade gifts or for stashbusting! A gorgeous scarf! This pattern is well-written, very detailed, and clear throughout. Date Added: 10/19/2012 by Meg P.
Date Added: 10/12/2012 by Monica B.